Authors: Jordi Carreras - Josep Valiellas. 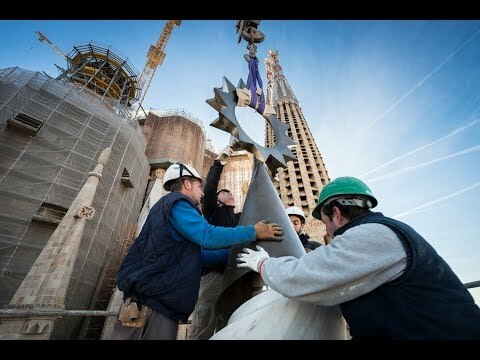 With the innovative tensioned-stone technique being used to build the structure of the central towers at the Sagrada Família, a third element, in addition to the stone and duplex stainless steel, comes into play. 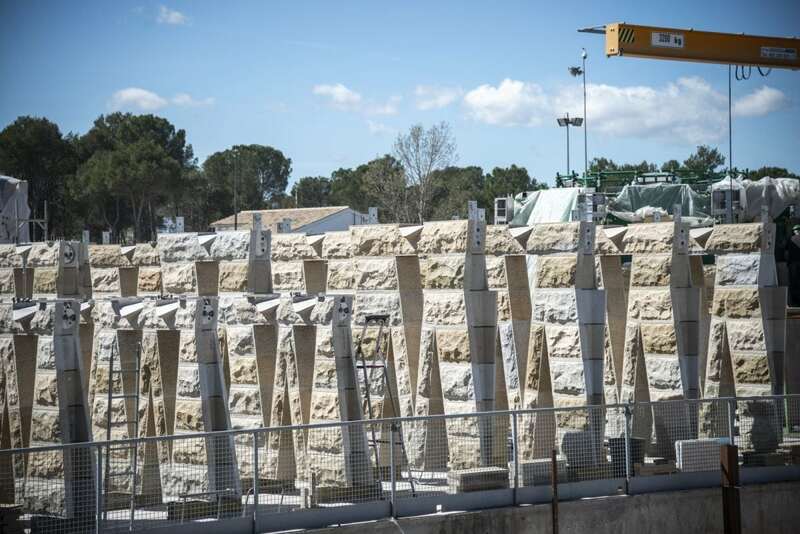 Its presence isn’t as obvious, but it is no less essential to the very concept of the tensioned stone. Resin: the element that binds together the metal anchors and the structural stone. 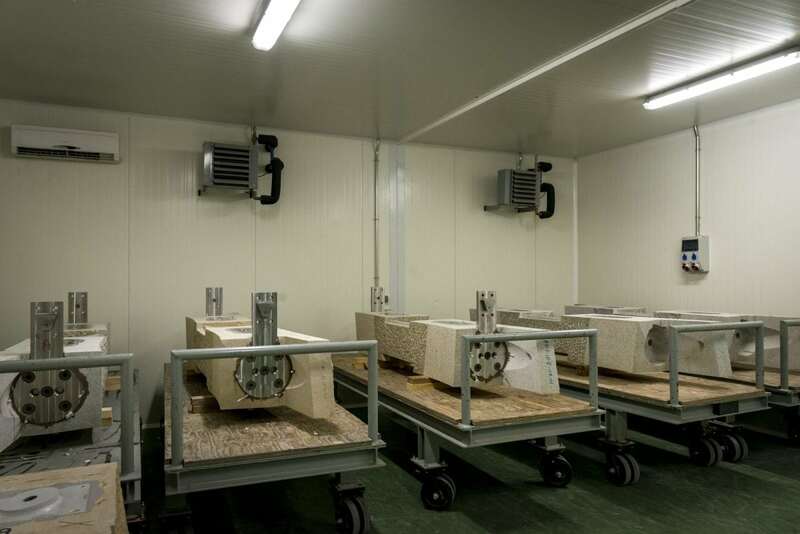 Faced with the need to ensure the duplex stainless-steel blocks are in the right spot inside the stone pieces, ensuring proper, lasting mechanical strength, the calculation engineers established the characteristics required of the epoxy resins. And this is what we use at the Sagrada Família for the purpose, to encapsulate the anchors. Epoxy resins are the most stable polymeric resins on the market, used for structural adhesion, lamination of glass and carbon fibres. They are characterised by their great dimensional stability and resistance to chemical agents, as well as for having high mechanical strength. So, they are the perfect resins for our temple. To completely fill the space between the stone and the anchors, with nominal thickness between 5 mm and 10 mm. To get the material we needed, we first searched the main brands of resins and structural adhesives to see if there was anything on the market that met these requirements. The chosen resin supplier would have to be global and used to working on very technically demanding projects, in addition to being able to test the materials internally and offer a wide array of products and formats. Before making the final resin choice, we did application tests at the workshop in La Galera with a 400-ml cartridge and a 20-kg pail to be applied with manual guns or an automatic injection machine. Based on the testing, the experts determined the required compression (not a common requirement for epoxy resins), yield strength, which measures the dimensional stability of the resin under a constant load and at 60°, and ageing. The testing for the last characteristic was done in test tubes subjected to 1,000 hours of ageing cycles according to the ISO 9142:2003 standard. 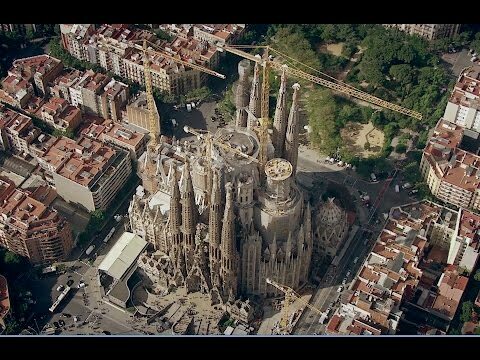 All of these tests to validate the epoxy resins were done at both the company’s internal laboratories and external ones commissioned directly by the Sagrada Família. The whole validation and final approval process took roughly 9 months, from October 2015 to June 2016. The resin we use at the Sagrada Família has two parts, which means it has better structural features than single-component resins. In these resins, component A acts as the main molecule of the adhesive polymer. The second component, B, acts as a catalyst, meaning it kicks off the molecular chain of the polymer (polymerisation). With epoxy resins, moreover, polymerisation takes place through polyaddition, which means the combination of components A and B must be exact. WHAT DOES WORKING WITH EPOXY RESIN REQUIRE? The industrialisation process for epoxy resin requires planning and gauging the workflow, infrastructure and injection machinery. In terms of the workflow, first the substrates are checked (the stone and metal) from a dimensional and visual standpoint. These have to cool to 22° C ±5° C and be cleaned with compressed air. Then, the anchors are put in with toolings to fix them in place. This is when the epoxy resin is injected. The piece then goes into the curing room, which is kept at 22° C. Finally, it goes into the post-curing room, which is kept at 40° C. This process ensures the epoxy has the best possible mechanical properties. Regarding the infrastructure, as a result of this process, we had to set up the space next to the main hangar with two separate zones: the first where the resin is applied and cured for at least 8 hours and the second for the post-curing process, where the pieces have to sit for 24 hours. After this time, they’re ready to be tensioned. Both areas have forced air with fresh air intakes. Finally, the injection machinery had to meet certain minimum criteria, which were determinant in choosing a manufacturer. 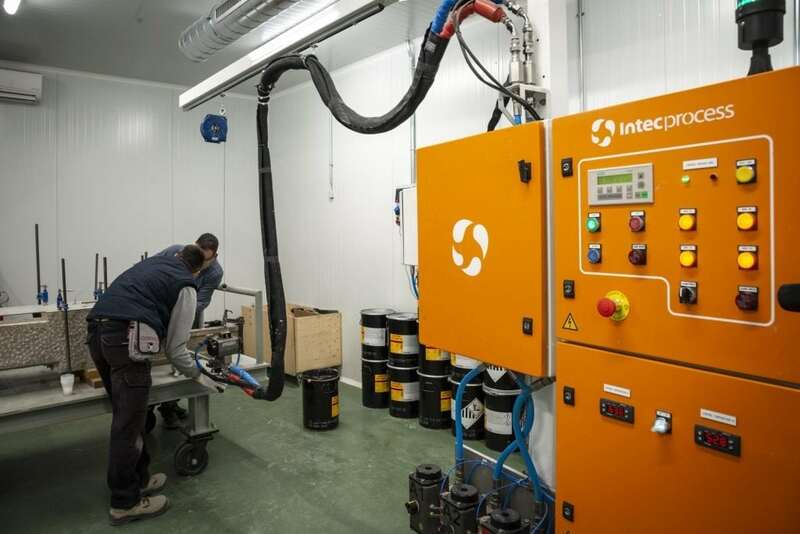 The most important of these characteristics were the need to measure and control how much of each resin component is injected and at what temperature, which led us to choose heated hoses. We also needed a non-stop injection system and a way to control the volume in the pails. Finally, the machine had to be strong enough to stand up to the abrasiveness of the additives in the resin and the company had to guarantee it could replace parts as needed to ensure it works properly. When the epoxy resin arrives and we receive the material, it is stored in an APQ (a fire-resistant, temperature-controlled container) because it must be kept at 15-17° C until it is used. In receiving the material, we register the code on each pail/cartridge, the batch number and expiry date. This information is very important because this resin must be used within the year. For the injection operation, first of all we record the outgoing resin. This is done by noting the pail number, batch and expiry date of the product coming out of the APQ, both product A and product B. 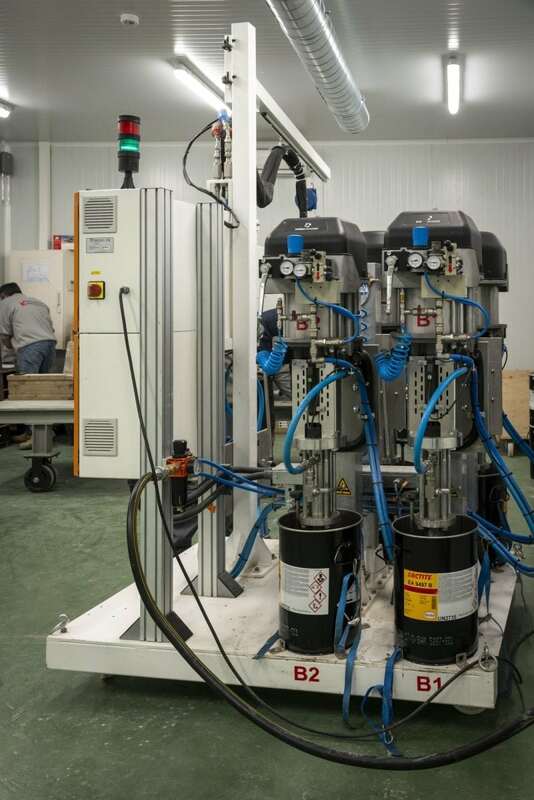 Each epoxy pail is put in the corresponding feed container, product A in the A pump and product B in the B pump. After the pails are put in place, the lines are purged to make sure there isn’t any air left in the pump. Then the weight and density of the product is checked. For the type of epoxy we use at the Sagrada Família, this control is done manually because it is a highly abrasive adhesive and we can’t use volume meters on the machine to ensure we get the right combination. So, this is done by removing a certain amount of the product and weighing it. The variation in weight must be within ±5% and, knowing the density of product A and product B, as well as that of the combination, we can determine whether the machine is using the proper doses. After checking that the machine is making the proper blend, we inject the resin onto all the anchors. First, a sample of the product is taken to determine the temperature of the hoses to make the product more or less fluid for optimal injection. 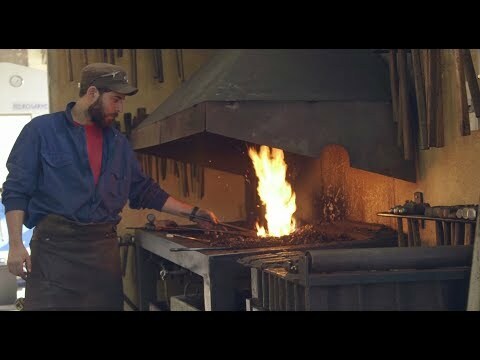 Once the product comes out with the right level of fluidity, we begin injecting the elements in question. After this is finished, the piece is left to rest for 8 hours at 22° C, as we mentioned before, and then moved into the post-curing room where it will sit at 40° C for 24 hours. After the final 24-hour setting period, the piece is removed from the post-curing room and any bits of resin that may have been left behind are cleaned off, with a visual check of the application and then quality control. 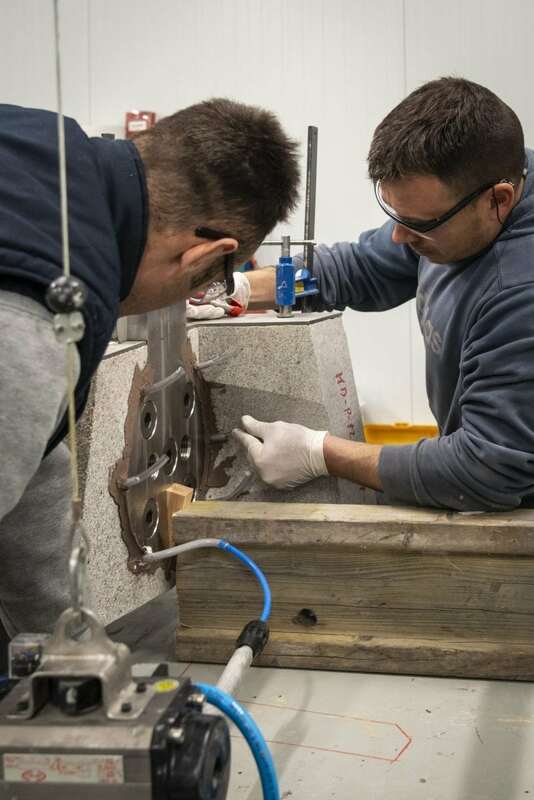 During the curing process, the epoxy joint is checked twice: first visually at the injection site, roughly 3 hours after injection, to make sure there aren’t any bubbles, porosity, fissures or separation of the adhesive from the stone or metal. The second check looks at the hardness and takes place in the post-curing area using a calibrated durometer, taking 5 measurements per block and taking the mean. This hardness must be 83 ±10 on the Shore D scale. Degree in Technical Architecture from the Polytechnic University of Catalonia. 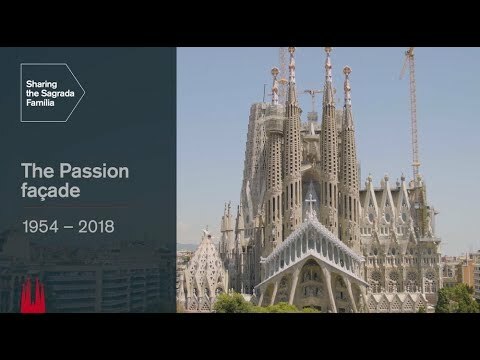 Head of production in the Building and Technology Department at the Sagrada Família since 2014. He has also held positions of responsibility at engineering firms, with developers and contractors. He is currently coordinating production of the main building elements for the central towers at the Basilica. Degree in Technical Architecture from the University of Girona Polytechnic School. Head of the work centre in La Galera, in the Building and Technology Department at the Sagrada Família. He also works as an independent contractor. His work at the Basilica currently focuses on planning and coordinating the work centre, where they do different sorts of pre-assembly.